A scheme is proposed for calculating the piezomagnetic fields that accompany the propagation of seismic waves through a non-uniformly magnetized crust. Examples of the calculations are provided. Generally, the calculation of the co-seismic piezomagnetic fields involves laborious three-dimensional volume integrals, even if the magnetization structure is two-dimensional. However, the calculation can be simplified by taking the Fourier transform of spatial distributions of the field into consideration. As an example, we have performed calculations for both the non-uniformly and uniformly magnetized crust with an intensity of 10 A/m. The incident seismic wave is considered to consist of Rayleigh waves with an amplitude of 5 cm. The amplitudes of the piezomagnetic signals arising from uniformly magnetized crust are up to 0.2 nT, whereas those arising from non-uniformly magnetized crust are as large as 0.5 nT. This result indicates that the piezomagnetic field may be a plausible mechanism of generating co-seismic changes in the magnetic field with detectable amplitudes for large earthquakes, provided that the observation site is located near the magnetization boundaries. Variations in the geomagnetic field are frequently observed in association with the propagation of seismic waves (e.g., Eleman, 1965; Matsushima et al., 2002; Iyemori et al., 2005; Abdul Azeez et al., 2009). Although such variations are usually considered to arise from two mechanisms—the electrokinetic effect (Ishido and Mizutani, 1981; Pride, 1994; Garambois and Dietrich, 2001; Bordes et al., 2008) and electromagnetic induction due to ground motions (e.g., Iyemori et al., 1996; Honkura et al., 2002, 2004; Ujihara et al., 2004)—there are other candidate mechanisms, such as those related to the resonance of ions (Honkura et al., 2009), the piezoelectric effect (Ogawa and Utada, 2000a, b) and the piezomagnetic effect. Among these other mechanisms, the piezomagnetic effect is investigated in the study reported here. The piezomagnetic effect involves changes in the magnetization of ferromagnetic minerals under mechanical stress (Stacey, 1964; Nagata, 1970; Stacey and Johnston, 1972). In the case that co-seismic variations are observed only in the magnetic field (e.g., Okubo et al., 2009), the contribution of the piezomagnetic effect must be taken into account because the electrokinetic effect and electromagnetic induction primarily generate electrical fields. Previous studies on variations in the geomagnetic field arising from the piezomagnetic effect have been performed in a framework of elastostatics (see the review by Sasai, 1994). To interpret co-seismic variations in magnetic fields in terms of the piezomagnetic effect, however, theories should be reconsidered in a framework of elastodynamics. An important finding of analyses of piezomagnetism based on elastostatics is the enhancement of the piezomagnetic field due to anomalies in the initial magnetization. Numerical calculations performed under an assumption of synthetic two-dimensional (2-D) magnetization structures have revealed that the magnitudes of the piezomagnetic field are strongly enhanced near the edges of magnetic anomalies, thereby explaining observed variations in the magnetic field (Oshiman, 1990). An enhanced signal is also implicitly indicated by assuming a realistic 3-D magnetization structure (e.g., Nishida et al., 2007). By analogy with these findings, the amplitude of the piezomagnetic field accompanying the propagation of seismic waves is also expected to be enhanced near the edges of magnetization boundaries. Numerical investigations in elastodynamics are required to quantitatively estimate the amplitude of the expected piezomagnetic field. Simulations of co-seismic variations in the piezomagnetic field are additionally complicated by the fact that they involve 3-D volume integrals, even if the magnetization structure itself is two-dimensional. In this paper, we propose a scheme for estimating piezo-magnetic signals arising from seismic plain waves passing thorough non-uniform initial magnetizations that is based on minimal calculations. Numerical examples are presented to determine whether the piezomagnetic effect generates variations in the magnetic field during the propagation of seismic waves with detectable magnitudes. where △Ji represents the change in magnetization due to the piezomagnetic effect, β is the stress sensitivity, △Tij is the increment in the deviatoric stress tensor, and Jj is the initial magnetization. In Eq. (1) and below, the Einstein summation convention is used. where x represents the location of the observation point, μm is the magnetic permeability, and V is the volume within which △Jj ≠ 0. Although Eq. (2) is a law of magnetostatics, it provides an accurate approximation of △Bi corresponding to time-varying △Jj, provided that the time taken for light to propagate from any point in V to x is negligibly small compared with the period of temporal variations in △Ji and provided that the attenuation of electromagnetic waves due to the induction effect in the Earth’s crust is negligibly small. Because the integrand of Eq. (2) rapidly decays according to the distance between x and a, it is possible to ignore the contributions from distances greater than a given threshold value (i.e., several tens of kilometers); hence, the time scale of light propagation is in the order of 10−4 s. The dominant frequencies of seismic waves produced by large earthquakes are <10 Hz, meaning that the periods of temporal variations in △Ji are smaller than 10−1 s. Therefore, the former of the above conditions is satisfied. In contrast, the validity of the latter condition remains uncertain; however, provided that we consider seismic surface waves with periods of several tens of seconds in a relatively resistive crust (i.e., with a resistivity >100 Ω·m), the induction effect is almost negligible. Indeed, the skin depth corresponding to electromagnetic waves with a period of 1/30 s in a conductor with a resistivity of 100 Ω·m is approximately 30 km, which is a sufficiently large distance for contributions from magnetic sources at a greater distance to be ignored. Hence, the following discussion is continued based on Eq. (2). where . The calculation of Eq. (11) is generally easier than that of Eq. (7) because the integral variables (i.e., a1, a2, and a3) in Eq. (11) only appear in the exponential, whereas those in Eq. (7) also appear in the denominator. In the cases of 2-D and 3-D structures, the integral of the reverse Fourier transform cannot generally be determined analytically. However, numerical calculations of these integral are rapidly performed via the fast Fourier transform. Therefore, the use of these formulae has advantages over an approach involving the direct calculation of the volume integral using Eq. (7). where θ represents the angle between x1 positive and the direction in which the Rayleigh wave is propagating; AR and LR represent the amplitude and wavenumber, respectively; υP, υS, and ωR represent the velocities of the P-, S-, and Rayleigh waves, respectively; ηP and ηS represent and , respectively (e.g., Lay and Wallace, 1995). Below, a Poisson solid is assumed, for which υR/υP and υS/υP take values of 0.531 and 0.577, respectively. The piezomagnetic field that accompanies the Rayleigh wave is determined by the sum of the fields arising from U1 and U2. To examine the degree of enhancement of the piezomagnetic field, two structures are considered with initial magnetizations expressed by V in Eq. (21) and V in Eq. (17). The former represents a horizontally uniform magnetization, whereas the latter represents a non-uniform magnetization. The intensity of the initial magnetization and the thickness of the magnetization are set to be the same in both cases. Cross-sections of the two cases are shown in Fig. 1. Example of cross-sections representing the distribution of magnetization in the Earth’s Crust. (a) Magnetization with a two-dimensional structure. (b) Magnetization with a one-dimensional structure. The x1 axis is the direction in which the magnetic anomaly extends; the x3 axis is vertically downward; the x2 axis is chosen in such a way that x1x2x3 forms a right-hand orthogonal system. The thick black lines represent the upper and the lower boundaries of the Earth’s crust. Gray areas represent the magnetized crust. In the formulation described in the previous section, the x1x2x3-system (which is fixed to the geometry of the magnetization boundary) is employed; however, the magnetization boundary does not always coincide with the geographical directions (e.g., north-south and east-west). Therefore, it is more convenient to consider another right-hand orthogonal system, XYZ, in which the X and Z directions correspond to magnetic north and vertically downward, respectively. Note that Z is equivalent to x3, but X and Y are not equivalent to x1 and x2, respectively. The direction of initial magnetization is assumed to be the same as that of the ambient geomagnetic field. For a case study, the set of parameters given in Table 1 is considered. The values of the depth and thickness of the magnetized layer and the intensity of magnetization were chosen based on a previous study in which they were estimated in a strongly magnetized area (Nishida et al., 2004). Figure 2 shows examples of the results corresponding to various combinations of the two directions that characterize the geometry of the problem: the direction in which the magnetization anomaly extends, measured from the x1 axis (D), and the direction in which the Rayleigh wave propagates, measured from the x1 axis (θ). Calculations were performed for all combinations of D = 0°, 45° , and 90°, and θ; = D + 0°, D + 45°, and D + 90°. Parameters used in calculating changes in the magnetic field. 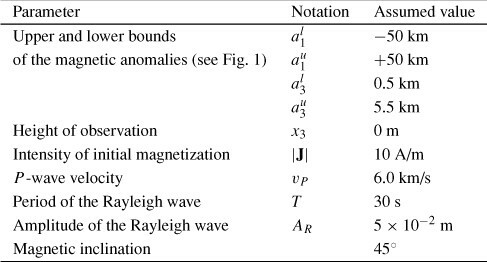 Amplitudes of the piezomagnetic signals arising from Rayleigh waves propagating over magnetic anomalies. Panels in the top row show plan views of definitions of the directions employed in the calculation. Definitions of the x1 and x2 axis are provided in Fig. 1. The other panels show the corresponding results. Curves represent the amplitudes of signals arising from non-uniformly magnetized crust (i.e., Fig. 1(a)), and dashed lines represent those arising from uniformly magnetized crust (i.e., Fig. 1(b)). The second, third, and fourth rows from the top show results corresponding to Rayleigh waves propagating to the north, northeast, and east, respectively. The left, center, and right columns show plan views and results corresponding to the cases of magnetic anomalies oriented north-south, northwest-southeast, and east-west, respectively. In each panel, D represents the direction of magnetic north (i.e., X axis), as measured from the direction in which the magnetic anomaly extends (i.e., x1 axis), and θ represents the direction in which the Rayleigh wave propagates, as measured from magnetic north. It is clear that for most of the calculated situations, the amplitudes of the piezomagnetic signals arising from the non-uniformly magnetized crust (referred to as ΔBNU) are much larger than those arising from the uniformly magnetized crust (referred to as ΔBU). For example, consider the results shown in the third row of the first column in Fig. 2, in which a Rayleigh wave propagates to the northeast over a north-south magnetic anomaly (i.e., D = 0° and θ = D + 45°). In this case, the X, Y, and Z components of ΔBU are 0.09, 0.09, and 0.13 nT, respectively. In contrast, those of ΔBNU reach 0.10, 0.47, and 0.49 nT, respectively, at a point just above the contrast in magnetizatio.Given that the minimum distinguishable amplitude of co-seismic variations in the magnetic field is approximately 0.1 nT, signals in the Y and Z components are expected to be detectable in the case of non-uniform magnetization, whereas the detection of clear signals is expected to be difficult in the case of uniform magnetization. The results just described were obtained for a specific geometry of the magnetized layer. To confirm that the significant enhancement of the piezomagnetic signal is a general feature in the case of the non-uniformly magnetized crust, BNU and BU are estimated for various depths and thicknesses of the magnetized layer. As an example, calculations are performed for the setting with D = 45° and θ = 0°; the values of the other parameters are those listed in Table 1, unless specified otherwise. Figure 3 shows the maximum amplitudes of BNU (referred to as (BNU)MAX) near the edges of the magnetization boundary and BU. The first step is to examine how the expected amplitude of the piezomagnetic signals changes in relation to the depth of the top of the magnetized layer (al3). An important result shown in Fig. 3(a) is that the factor of amplification (i.e., the ratio between (BNU)MAX and BU) remains largely unchanged as (BNU)MAX and BU decrease with increases in al3. The next step is to examine how (BNU)MAX and BU change in relation to the bottom depth of the magnetized layer (al3) (Fig. 3(b)). 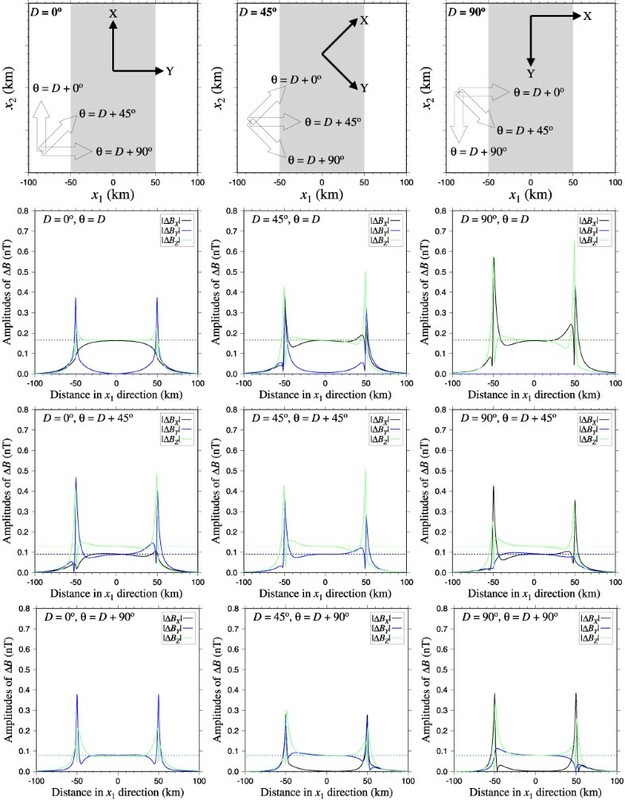 The results show that (BNU)MAX and BU are almost constant with increasing au3 , indicating that the factor of amplification is also constant regardless of variations in au3. The last step is to examine how (BNU)MAX and BU depend on the period of the Rayleigh wave (Fig. 3(c)). This test is important because seismic waves generally consist of various components with different frequencies. For periods longer than 20 s, the factor of amplification is largely constant, similar to the results obtained when al3 and au3 are varied. However, for periods shorter than 15 s, the factor of amplification is smaller than that for longer periods. Given that the dominant periods of Rayleigh waves are longer than 15 s, this change in amplification at a period of about 15 s can be ignored in the present study. Taking the above results into account, enhancement of the piezomagnetic effect is expected to be observed near the edges of the magnetization boundary, regardless of the depth and thickness of the magnetized body and of the wavenumber of the Rayleigh wave. Maximum amplitudes of the expected piezomagnetic signals (ΔBX , ΔBY, and ΔBZ) plotted against assumed parameters. (a) Dependency on al3, i.e., depth of the top of the magnetized layer. (b) Dependency on au3, i.e., depth of the bottom boundary of the magnetized layer. (c) Dependency of T, i.e., period of the Rayleigh wave. Values of unspecified parameters are set to al3 = 0.5 (km), au3 = 5.5 (km), T = 30 s, and those listed in Table 1. Solid, dashed, and dotted curves represent ΔBX , ΔBY , and ΔBZ, in the case of magnetization, respectively. Curves in black and gray represent results corresponding to the non-uniformly and uniformly magnetized crust, respectively (i.e., (BNU)MAX and BU, respectively). The values of ΔBX and ΔBY, in the latter case are the same, so that only ΔBX is plotted. The numerical estimations outlined in the preceding section focus on a persistent seismic wave with a single frequency as a source of the piezomagnetic effect: temporal variations in seismic waves are ignored. In contrast, the propagation of actual seismic waves is a transient phenomenon. To provide a precise description of the piezomagnetic field that accompanies transient seismic waves, it is necessary to consider the explicit forms of seismic waves and calculate the inverse Fourier transform of the formula obtained in the present study. For this exact estimation, this treatment must take place at the initial moment at which seismic waves cross the magnetization boundary or the observation site. However, the focus here is on the time during which the seismic wave crosses the boundary or observation site, without considering the initial moment. In this case, the calculation of the piezomagnetic field for a persistent elastic wave provides a good approximation of the field for a transient elastic wave (Yamazaki, 2010). It has been confirmed that the piezomagnetic field is significantly enhanced near the edges of the magnetization boundary. Moreover, the obtained amplitudes of the signal appear to be of detectable magnitude. Nevertheless, the above results do not indicate that the piezomagnetic effect is always a plausible mechanism in terms of generating coseismic variations in the magnetic field. The magnitude of piezomagnetic signals depends on the intensity and spatial structure of the initial magnetization, and the amplitudes of the expected piezomagnetic signals are obtained only for assumed values. In addition, the formulation proposed in this paper assumes that the Earth’s crust is electrically resistive. Yamazaki (2010) derived an analytical expression of the piezomagnetic field that accompanies seismic waves in a crust with finite conductivity and uniform magnetization and reported that conductivity may sometimes induce a significant increase or decrease in the time-varying piezomagnetic signals. The result obtained here for non-uniformly magnetized crust may vary in the case of relatively high conductivity. In this sense, the results outlined in the preceding section represent a prediction corresponding to a specific set of parameters; however, given that the assumed parameters are not unrealistic, the results can be considered to be realistic for selected situations. The assumed intensity of initial magnetization (i.e., 10 A/m) is relatively large, but has previously been estimated as the initial magnetization of the Earth’s crust (e.g. Nishida et al., 2004). The assumed amplitudes of the Rayleigh wave are also rather large, but amplitudes of this magnitude are observed at farfield sites in the case of large events, such as the 2004 Sumatra-Andaman earthquake and the 2010 Chile earthquake. Therefore, it is concluded that the piezomagnetic effect may be a plausible mechanism of co-seismic variations in the geomagnetic field in certain settings, particularly if the magnetometer is installed near magnetization boundaries. In a wavenumber space, the piezomagnetic field arising from the propagation of seismic plane waves over a blockshaped magnetization has an analytically closed-form expression. Spatial variations in real-space are rapidly calculated after applying a reverse Fourier transform. Examples of numerical calculations performed using the developed formulae reveal that the piezomagnetic signals are considerably enhanced near the magnetization boundary. Enhancements are commonly seen, regardless of changes in the depth and thickness of the magnetized layer. This finding suggests that if the observation site is located near the magnetization boundary, the piezomagnetic effect is a plausible mechanism in explaining variations in the geomagnetic field during the propagation of seismic Rayleigh waves, along with other mechanisms, such as the electrokinetic effect and the induction effect due to ground motions. The author thanks Dr. Koki Aizawa (Earthquake Research Institute, University of Tokyo), Mr. Kento Taira (Graduate School of Science, Kyoto University), and Dr. Toshihiko Iyemori (World Data Center for Geomagnetism, Kyoto University) for discussions that motivated this study. Comments provided by two reviewers, Dr. Gilda Currenti and Dr. Takeshi Hashimoto, greatly improved the quality of the manuscript, as did the patient editorial handling of the manuscript by the Associate Editor, Dr. Kiyoshi Yomogida. Figures 2 and 3 were drawn using Generic Mapping Tools (Wessel and Smith, 1998). Okubo, K., A. Takeuchi, Y. Suyama, M. Utsugi, Y. Sasai, Y. Nakamura, and N. Takeuchi, Observation of magnetic signals from earthquake faulting: co-faulting signals in the Iwate-Miyagi Nairiku Earthquake of M 7.2, NE Japan, Eos Trans. AGU, 90(52), Fall Meet. Suppl., Abstract NH31C- 1125, 2009.